That is one truth depicted in this painting by artist Nathan Greene, entitled "The Senior Partner." A note on this website (where you can also buy copies of this and other works by Mr. Greene) confirms that Jesus is in fact the titular "Senior Partner," although we could probably have guessed that—it's not like anybody would make Him go through a job interview or depict Him doing such. The message is simply that for Christians, Jesus is involved in all facets of life. An admirable message and one protected by the First Amendment. The website does go on to suggest that "[d]isplaying this piece prominently in your business will convey your Christian principles and values to your business associates, customers, and staff." It certainly would do that, and depending on the business, it might also get you sued or at least serve as evidence if you get sued for religious discrimination. 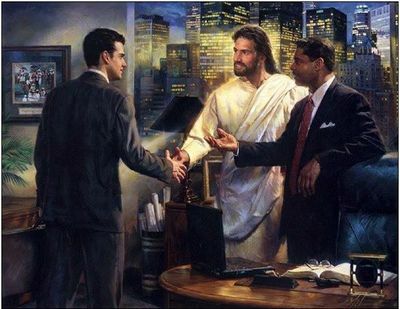 Replace the Savior's image with one of Vishnu or Muhammad or whoever and imagine this hanging in your managing partner's office, or in all the partners' offices, and you might have a better sense of the problem. Don't actually replace it with an image of Muhammad, please. That is just a thought experiment. Yes, the dress-code exception would also extend to hairstyles, although in our experience that hasn't been much of a problem. We did just "encourage" a new associate to lose the ponytail, but he could have kept it if he'd really wanted to. But again, if the Senior Partner wishes to show up in a mullet, or whatever, that would be totally His prerogative.